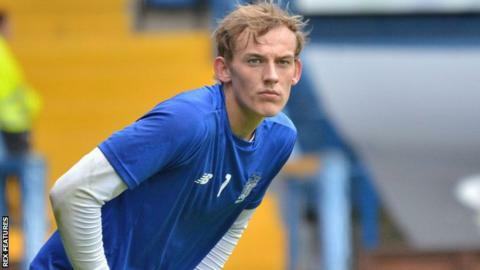 Brighton & Hove Albion goalkeeper Christian Walton is hoping to go out on loan again after a groin injury curtailed his spell at League One Bury. The 20-year-old was due to remain with the Shakers for the whole season but returned to the Amex Stadium for treatment at the end of August. "It was a great experience at Bury and I really enjoyed it but it was a shame to get the injury," he told BBC Sussex. "I need to go out and get some more game time under my belt." Walton made six appearances during his stint with Bury and described his time at Gigg Lane as "really beneficial". "It was a good standard and helped me massively," he said. "It was cut short but I felt I improved as a person and a keeper. "I'd like to play in League One but if not I might have to be patient and keep playing under-21 games here. "I need to keep doing my thing in training and make sure I have the right attitude and application." Walton is currently in the England Under-21 squad for their matches against Bosnia-Herzegovina and Switzerland, with the latter game being held at the Amex on Monday. Seagulls team-mates Jake Forster-Caskey and Solly March have also been included in Gareth Southgate's squad. "It is great for the club to have three players in the squad," said Walton. "To be involved with England is a massive honour. Most of the lads in there have got experience of the Premier League so training with them is a great thing to be doing at this stage of my career. "Hopefully I can get some time on the pitch but I have to work hard."